The 7th annual Mosaic Film Experience event took place on November 7 and 8 at the Wealthy Theater. The Mosaic Film Experience is a full-day, interactive experience that provides students with access to industry professionals through creative, career-inspiring breakout sessions and exclusive presentations. The event also serves as the culmination of the annual Mosaic Mobile contest, an annual mobile film competition for high school and college students in which films are shot, edited, and entered on mobile devices. Students from Kent ISD and other Michigan schools attended the first full-day event on November 7, while the second day featured students from Grand Rapids Public Schools. The welcoming ceremony was the only portion of the programming that differed between the events on November 7 and 8; the rest of the day, which featured a screening of Starz documentary series “America to Me,” panel discussion, breakout sessions, a speech from acclaimed Hollywood costume concept artist Phillip Boutte Jr., and the student film screening and award ceremony–was the same. Day one began with an enthusiastic welcome from WZZM13 reporter and news anchor Jennifer Pascua, HBO’s vice president of sales strategy and education Carla Moore, and The Mosaic Film Experience’s founder Skot Welch. Pascua, who recently announced a career transition away from local news media, stressed the importance of digital content and creativity. “Never stop using your creativity to reinvent yourself and try something new,” said Pascua. HBO executive Carla Moore reiterated the importance of digital media and shared her tips for students in pursuit of careers. “You first must get the proper training and education, experience through internships, and, most importantly, you must have passion,” said Moore. The Mosaic Film Experience founder Skot Welch kicked off the second day’s event by introducing WOTV4’s community advocate Maranda. Maranda provided students with a real-time education lesson in live TV by explaining and preparing the students for a live interview from The Mosaic Film Experience event. Some of her presentation included technology demonstrations: She shared how newscasters communicate with their producers through an earpiece and how the cameras are able to capture and broadcast with ease thanks to powerful technology. Following the opening remarks on both days, students watched an episode of the Starz documentary series “America to Me.” This captivating series captures the racial and educational inequities of some of the highest performing schools in the country, and how they are often overlooked because of prejudices. A Q&A panel discussion was held after the screening. The day one panel featured Skot Welch, Hollywood costume concept artist Phillip Boutte Jr., Miss America Debbye Turner, and Kentwood High School teacher Caitlin Volovlek. 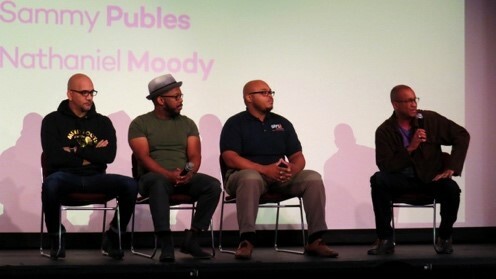 The day two panel included Skot Welch, Phillip Boutte Jr., Pastor Nathaniel Moody, and actor Sammy Puebles. Both days featured an engaging and incredibly insightful conversation, where students shared their thoughts and experiences with prejudices and what we can do as a community to combat them. Following the panel discussion, students participated in breakout sessions. Topics included creative writing collaboration with Mike Saunders of the West Michigan Center for Arts and Technology, mobile filmmaking with Mallory Patterson and Randy Strobel of Wrinkle Creative, careers in social media and personal branding with Adam Russo of COM 616 and Erik Lauchiè of Carbon Stories, poetry in motion with Gabriel Giron and Kirk Latimer of Kinetic Affect, and comedy in storytelling with comedian Mike Logan. 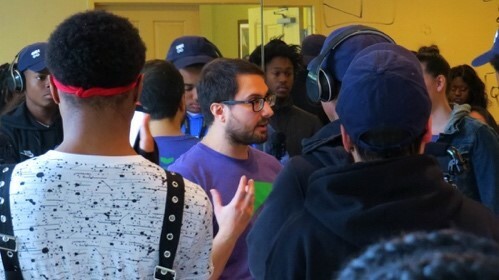 Breakout sessions provided students with valuable, real-world insights into creative careers. Next, students gathered back in Wege Auditorium to welcome back Phillip Boutte Jr., who has worked on Hollywood blockbusters such as “Black Panther,” “Guardians of the Galaxy Vol. 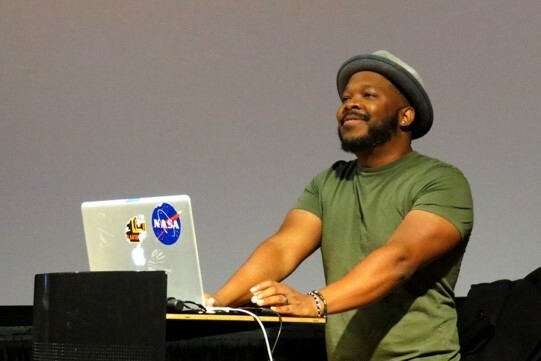 2,” “A Wrinkle in Time,” “Inception,” and “The Hunger Games.” Boutte provided students with an exclusive look at his most recent project highlight reel, which was met with a roaring applause, as well as creative process and career as a costume concept artist. Boutte’s connection with the students was clear as they cheered throughout his demo reel. The students were inspired by the opportunity to see “behind-the-scenes” looks at many of his projects and how they developed from start to finish. Boutte encouraged the students to express their creativity, follow their passion, and to turn their dreams into goals in order to achieve them. Subsequently, we screened the films of the top 10 Mosaic Mobile finalists in the high school category. During this time, we recognized the hard work that many high school students from our community put into participating in the 2018 Mosaic Mobile film competition. Mosaic Mobile encourages high school and college students to create a short film using only their mobile device. Each annual competition has a unique theme, prop, and saying that the students must implement into their pieces. This year, the theme was “Tell a Story,” the prop was art, and the words “It’s different know” had to be shown or spoken in the film. The room was captivated by the messages our creative students were able to convey through their short films. It was clear that the students had realized their potential to create and share their own unique stories. Throughout The Mosaic Film Experience Event, students witnessed firsthand the beautiful works of art that could be created with nothing more than a mobile device. They saw real-life examples of where their creative minds may be able to take them after they finish school and learned tangible, career-based skills during the breakout sessions. These students left the 2018 Mosaic Film Experience Event feeling unstoppable.